Enter the world of the medieval alchemists. The research for The Hermetica of Elysium involved delving onto the mysterious world of the medieval alchemists and the works of philosophers and thinkers of the middle ages and renaissance who were influential in the rise of Humanism that sparked the Protestant Reformation. In an era where there could be no hope of free expression, the brightest minds of the times were forced to communicate with each other through symbol, subterfuge and cryptic messages. Books containing the intellectual and spiritual discoveries of individuals were collected and passed around secretly, most often written in the more obscure languages to protect the both the message and the man from the eyes of the powerful Church. When such a book is found to have an enhanced ability to transmit the knowledge and secrets of the ancients, it becomes the object of desire to many…both within and without the Church. 1494 Barcelona. As Torquemada lights the fires of religious fervor throughout the cities of Spain, accused heretics are not the only victims. Thousands of books and manuscripts are lost to the flames as the Black Friars attempt to purge Europe of the ancient secrets of the gods and the bold new ideas that are ushering in the Renaissance. Nadira lives a dreary life as servant to a wealthy spice merchant until the night a dying scholar is brought to the merchant’s stable, beaten by mercenaries who are on the hunt for The Hermetica of Elysium. To Nadira, words are her life: she lives them as her master’s scrivener and dreams them in her mother’s poetry. She is pursued as passionately as the fabled manuscript for her rare skill as a reader of Ancient Greek, Latin, Arabic and Hebrew make her valuable to men who pursue the book to exploit its magic. 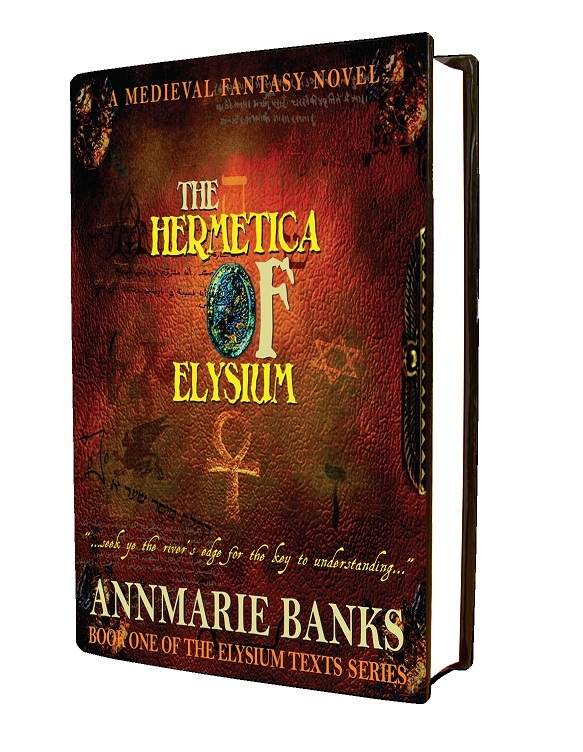 Kidnapped by Baron Montrose, an adventurous nobleman, she is forced to read from the Hermetica. She begins to understand that ideas and words are more powerful than steel or fire for within its pages are the words that incite the Dominicans to religious fervor, give the Templars their power and reveal the lost mysteries of Elysium. Nadira soon finds herself lost in the power of the Hermetica and the love of Montrose. But as she begins her journey from servant to sorceress, can she escape the fires of the Inquisition, the clutches of the Borgia pope, Alexander VI and the French king, Charles VIII?